In the early days of video games, the name Atari was one that became equated with playing such games. So much so, that pretty much anyone would interpret the question “did you play Atari today?” with “did you play video games today?” Atari was a cultural icon at the time and this icon knew it had to do everything it could to attract people to their games. One way in which the company did this was by having very sophisticated artwork for all its games, whether in the arcades or for their home systems. The artwork was a portal into gamers’ imaginations that helped transform the collection of pixels on the screen to a much larger world. This was particularly true for games on the Atari 2600 VCS. Who can forget the impressive dragon and the beautiful castle on the box of Adventure? Yet the world we got on our TV screens was far more simplistic with dragons that have always been called “ducks” by many. The artwork of Atari games needed to be celebrated and thanks to Tim Lapetino, we now have a way to properly do so. 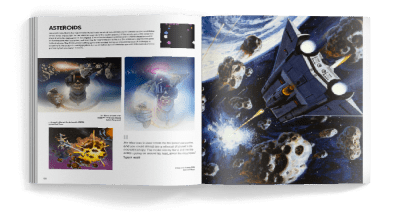 In creating The Art of Atari, Tim has given us a book that offers a great insight into the art that made Atari so recognizable. This book, however, is much more than just a book about the art of this once great video game company. 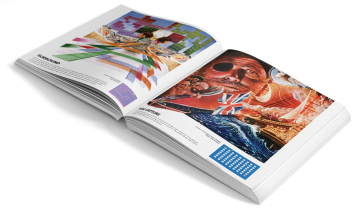 Within its pages you’ll be able to learn about the history of Atari, learn about how Atari’s visual style came to be, meet various of the artists who worked for the company and, of course, see plenty of artwork related to just about anything Atari. When you set your eyes on The Art of Atari, you immediately know you are in for a treat. Printed as both a Limited Deluxe Edition and a Standard Edition, the book impresses even when looking at its cover. 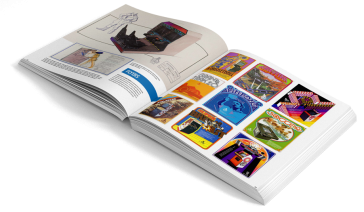 On the Standard Edition there are various images of games for Atari consoles while the Limited Deluxe Edition has a slipcase with similar artwork but designed to look like an Atari 2600 cartridge from the system’s early days. 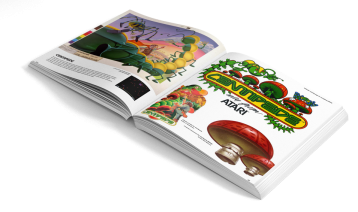 Open the book to be treated to three spreads of screenshots of Atari 2600 games. Similar spreads can be found on the back-end of the book. Ernest Cline, author of the videogame inspired Ready Player One and Armada, wrote the foreword which is then followed by an introduction by Tim. In this intro Tim relates the story of how this book came about, something that I will not spoil for you. 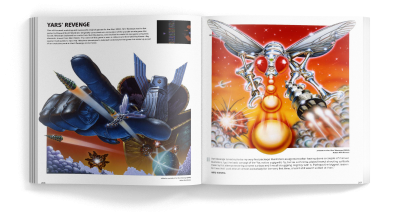 Being a book about art, The Art of Atari is filled with pictures and images of all sorts. You’ll see pictures of the company founders, the artists, logos for the company and its consoles, advertisements, and plenty of game-related artwork. An entire section is dedicated to the home consoles and, in this section, brief histories for each home system are provided with pictures of the consoles themselves, their boxes and printed ads. I can only imagine the time it must have taken to find all of these images! This is followed by Box Artwork and this is an area where the book shines. As I said before, it was the artwork that impacted our imaginations and this is something that is discussed in this section. For each bit of artwork shown (many of which are pictures of actual game boxes), there is a short discussion about the game presented along with a screenshot of the game that came in that box. Of course, the images come with credits to the artists who made these pieces of imaginative art. This section also includes profiles for various of these artists with lists of the games they developed art for. Though much of the artwork presented here is from Atari 2600 games, alternate artwork for some games as well as artwork for some of the other consoles is also included. Also included are sections dedicated to two rather (in)famous games made by Atari: Pac-Man and E.T. The Extra-Terrestrial. These sections provide added history about these games, even including details about a certain dig in Almagordo, New Mexico. To make the book even more complete, there are examples of unreleased artwork as well. One such example is preliminary artwork for SwordQuest Airworld, a game that Atari never released. 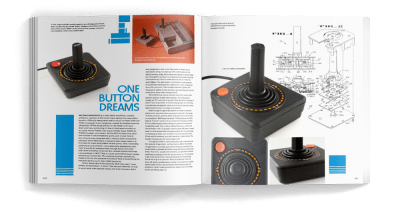 As if that weren’t enough, there are sections looking at console designs, prototypes, and other unreleased Atari technology (Mindlink, anyone?). As for the book itself, it is simply a gorgeous piece of work. There are graphics everywhere with ample text to read but nothing ever feels unbalanced. The print quality is top-notch and the book even has one of those ribbon bookmarks that are not often seen in books today. One thing that I found “cool” is that you can really tell the picture of the boxes are very real boxes. Some of them still have their price tags and in others you can see creases and imperfections that should be expected from boxes that are well over 30 years old! Though the book was released in two formats, as I mentioned earlier in the review, I believe only the Standard Edition is available right now for purchase. Regardless, this is a book every retro gamer and every Atari fan must have in their library. Clearly, a lot of effort and hard work was put into the creation of this masterpiece of a book and it is not to be missed. I suggest you check out its official website (http://www.artofatari.com/) for more information. Clearly, a lot of effort and hard work was put into the creation of this masterpiece of a book and it is not to be missed. ← Super Famicom – The Box Art Collection: Book Review.